Italy's Amalfi Coast is pictured left. 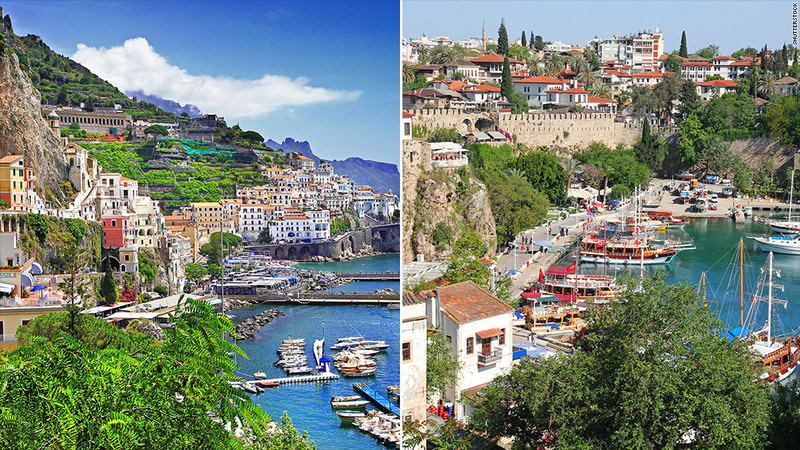 On right, is Antalya, located on Turkey's southern coast. The charming towns of Italy's Amalfi Coast cling to the cliffs that rise up from the blue Tyrrhenian Sea. Flowering vines spill over stone walls, small church steeples rise over the narrow streets and chic cafes and restaurants occupy stone-paved squares. This Italian bucket-list destination is a classically romantic spot, but it will cost you. If you're looking for a more affordable alternative, try the gorgeous Turkish Riviera instead. You won't save on airfare but nearly everything else -- hotel rooms, restaurants, shopping -- is less expensive. As for the food, it may be lamb kebabs instead of cannelloni but the cuisine is delicious and affordable. *Note: Trip costs were based round-trip airfare from Chicago for the week of May 24th through May 31st and stays at a four-star hotel, as reported by Expedia and Hotwire.com.